Nestled amidst palm trees and exotic plants, the Veranda Grand Baie, already a popular holiday haven, has been completely refurbished to bring you even higher standards of luxury. Overlooking a beautiful white, sandy beach, it is simply bursting with Creole charm. The hotel overlooks the aptly named Grand Baie on the north coast of Mauritius. The bustling town centre is also just a short walk away. Around an hour from the airport. 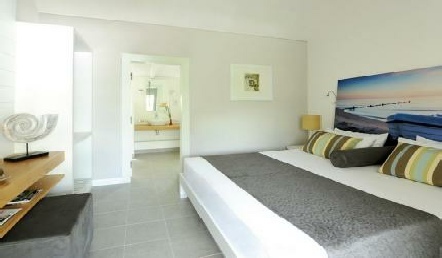 All rooms have been sumptuously decorated with cool, soothing tones and the latest mod cons. Enjoy a pre-dinner drink from your private balcony or terrace, admiring stunning views of the surrounding gardens or swimming pool. Water sports are, of course, in ample supply. Windsurfing, kayaking, snorkelling and pedal boats are complimentary as is a glass bottom boat ride so you can admire life below the waves without getting wet! Pay a bit extra and you can join PADI qualified instructors on diving expeditions and water ski to your heart’s content. Dry land sports are plentiful too with tennis courts for the enthusiast, volleyball and bicycles for hire. Whilst parents are lounging besides one of two pools, the Timomo Kids club will keep little ones entertained with a whole range of exciting activities to get involved in. There’s also a fully equipped fitness centre and the delightful Seven Colours Wellness Spa should a spot of pampering, well-deserved no doubt, appeal. Le Mon Plasir is open for breakfast, lunch and dinner, serving a delicious range of local dishes as well as more international favourites. Belle Vue Restaurant, set right beside the ocean, is more suited to special occasions, taking you on a culinary journey you’ll never forget! 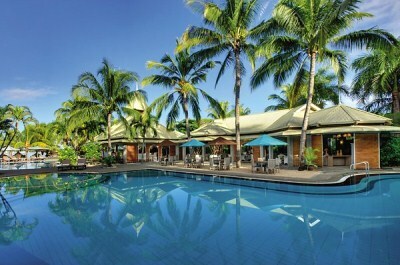 2019 package holidays to the Veranda Grand Baie Mauritius Prices are per person based on two sharing.